Here you'll find the official game rules for the popular game Tile Rummy. Different releases of the game included slightly different game rules. All these variations are described below. All game rules and variations are also supported in the download game RRRummy. With RRRummy, you can play the same type of games, solo against the computer, or together with friends and relatives. You can download RRRummy from this site. The game is played with 106 numbered tiles. Tiles are numbered 1-13 in four different colors, each tile appearing twice; and there are two Jokers. All tiles are shuffled and placed on the table, face down. Each player takes one tile; the player who has the highest value, gets the first turn. Then these tiles are put back onto the table, and each player takes 14 tiles. The remaining tiles will form the stock. You play a run if you play three of more tiles of the same color, with numbers in sequence, like 456 or 910111213 . A 1 is only valid in front of a 2, and never after a 13. So this is not valid: 12131 . You play a set if you play three or four tiles with the same number, in different colors, like 777 or 1111 . All colors must be different, so this is not valid: 444 . In each turn, you may take tiles that are already on the table and combine them with your own tiles to form new melds. 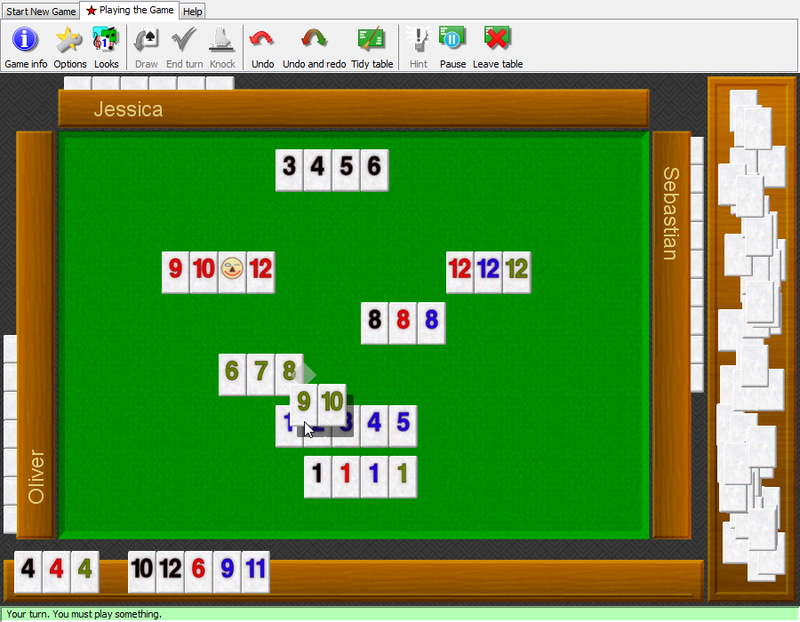 At the end of your turn, however, all tiles on the table must be part of valid runs or sets again. It is not allowed to take tiles that were on the table at the start of your turn, and put them back into your hand. Jokers are wildcard tiles that can represent any other tile. You play Jokers in the same way as you would play the tile they stand for, for example: 4*6 or 77*7 . Many releases of the game box contain rules that impose special restrictions on the use of Jokers. All these restrictions are also supported in the computer download game RRRummy. In the most lenient variation, you may use and rearrange Jokers in any way you like, without any restriction other than that each tile must end up being part of a valid meld. A popular variation is that you must replace the Joker with the matching tile, before you can use it anywhere else. In a set of three, the Joker can be replaced by any of the missing colors, e.g. in 22* you can release the Joker with either a 2 or a 2 . Most of the times the previous rule is used, there is an additional restricton that the matching tile must come from your hand. You cannot replace the Joker by a tile that was already on the table. Often the game is played with the additional rule that you cannot take away tiles from a meld that contains a Joker, unless you replace the Joker by its matching tile first. When you have replaced a Joker with the matching tile, an additional optional restriction lets you only use it in a new meld with your own tiles. So with this rule, you cannot add a Joker to an existing meld. When you have played all the tiles you can (or want to), you say "Done!". Then the player at your left will get the turn. If you didn't play any of your tiles in your turn, then you have to draw another tile from the stock. Your turn still ends, so if you can play that new tile, you will have to wait until your next turn to play it. Before you can play anything else in a game, you must play one or more new melds with a total of 30 or more. For example: 91011 , or 3333 56* . Jokers in these melds count as the tile they stand for. Only when you have played a total of 30 or more in new melds, you may add tiles to other melds or rearrange tiles that are on the table. If you can play new melds but they don't add up to 30, then you have to draw another tile from the stock and wait for your next turn. Once you have played 30 or more in new melds, then in subsequent turns you can play anything you like. In some editions, the rules mention a minimum of 50, not 30. When you end your turn and not all tiles are part of a valid meld, or when you did something else invalid, for example add a tile to another meld before having played your initial 30 points, then you have to put back all tiles to where they were at the start of your turn. Then you have to draw three tiles from the stock, and your turn ends. When you have played all your tiles in valid melds, so you have no tiles left, then you win the game. 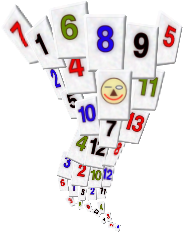 All players add up the numbers of their tiles, whereby Jokers count as 30. 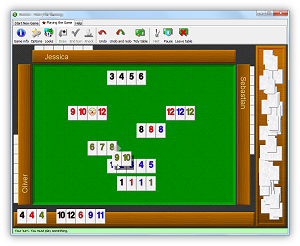 The winner of the game adds to his or her score the total of all tiles of the other players; the other players each subtract their individual total from their score. Before starting to play, players have to agree whether they play a set number of games, or for a given amount of time, or until one player reaches a target score. The winner of the match is the player who has the highest score. Not included in the box, but available as an optional extra, is an egg timer. When you play with a timer, each player only gets 2 minutes to complete their turn. When your 2 minutes are up before all tiles are part of a valid meld (again), then you have to put back all tiles where they were and you have to draw three penalty tiles from the stock. In RRRummy, you can play any game with an optional timer, varying from 20 seconds to 2 minutes.